After months of delay, peace talks between the government of the Democratic Republic of Congo (DRC) and M23 rebels are back on, at the urging of regional leaders. But analysts remain sceptical that a truce can be achieved after more than a year and a half of intermittent fighting in eastern DRC's North Kivu Province. "We are very optimistic we shall be able to deliver something in the two weeks," Kiyonga told IRIN. "There is renewed commitment by the two sides. For some time, the government side was not here [Kampala]. But now everybody has come." M23 - the March 23 Movement – came into existence in April 2012, when hundreds of mainly ethnic Tutsi soldiers of the national army (FARDC), mutinied over poor living conditions and poor pay. Most of the mutineers had been members of the National Congress for the Defence of the People (CNDP), another armed group that in 2009 signed a deal with the government, which the dissidents felt Kinshasa had not fully implemented. 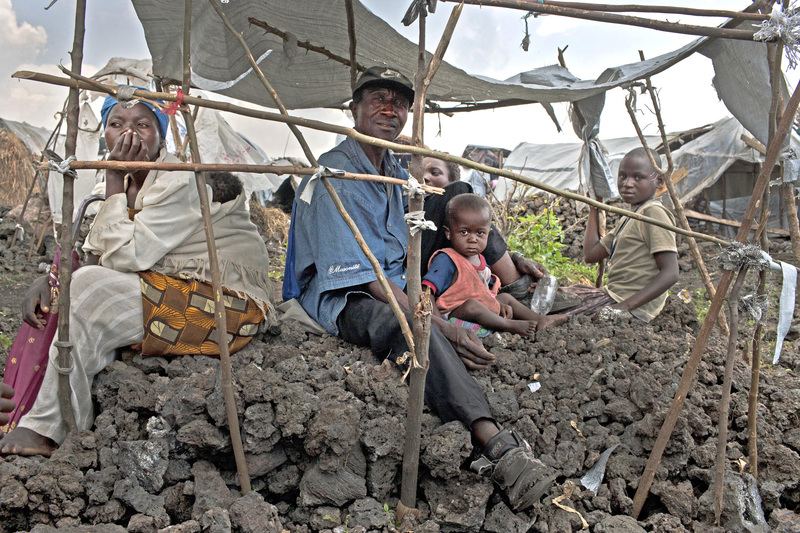 An estimated 900,000 people are currently displaced in North Kivu, more than half of them by the M23 rebellion; tens of thousands more have fled across the DRC's borders with Rwanda and Uganda. Humanitarians continue to flag the issue of civilian protection as FARDC and M23 engage in intermittent battles in and around the provincial capital Goma, where the fighting has displaced more than 100,000. While on a joint visit to DRC, Uganda and Rwanda, a delegation of senior African Union, European Union (EU), UN and US officials, led by the UN Secretary-General's Special Envoy to the Great Lakes Mary Robinson, called for the implementation of the Peace, Security and Cooperation Framework for the DRC and the Region. The framework aims for, among other things, improving security and consolidating the state's authority in eastern DRC. The agreement was signed on 24 February in Addis Ababa, Ethiopia, by 11 African countries. The officials also urged all parties to "bring the Kampala Dialogue to a positive and swift conclusion", encourage the reduction of tensions in eastern DRC, and "identify and support confidence-building measures between DRC and Rwanda". "The Congolese government is coming back to the negotiations table but seems forced to do so. During the opening of the national consultations [held in Kinshasa on 10 September], President Kabila made it clear that if the talks fail, the fighting will resume," Thierry Vircoulon, an analyst with the South Africa based think-tank International Crisis Group (ICG), told IRIN. "I think concerted pressure by a variety of envoys from the US, the EU, Belgium and the UN has made an impact, particularly through pressure on Rwanda [which is accused of supporting the M23 rebels, a claim vehemently denied by the Rwandan government]. Whether this will amount to anything, however, remains to be seen," Jason Stearns, director of the Rift Valley Institute's (RVI) Usalama Project, which conducts research on armed groups in eastern DRC, told IRIN. "The initial statements by the M23 and the Congolese government do not look promising. If the talks are to succeed, both sides will have to bridge a deep divide on various issues, particularly whether the top leadership of the M23 can be integrated into the army and whether they will be redeployed across the country," he added. Kiyonga told a media briefing on 10 September that the two parties had reached a draft peace deal, with 60 percent of its clauses agreed upon. According to Rene Abandi, head of M23's delegation, some of the key sticking points include: the reintegration of top M23 leadership into FARDC; disarmament and demobilization of the rebels; and the elimination of the DRC-based, Hutu-dominated Rwandan rebel group Forces démocratiques de libération du Rwanda (FDLR). Abandi said he hoped this time "we shall be able to handle all the issues", sentiments echoed by Francois Mwamba, spokesman for the DRC government's delegation. "One of the key outcomes of this round of talks will be how the ICGLR and the parties themselves deal with the issue of amnesty and impunity for the leadership of the M23. A divide has already become apparent with both the UN and US envoys making statements that amnesty must not be an option for M23 senior leadership, while the current chair of the ICGLR, President Museveni, has publicly stated that amnesty must be on the table," Aaron Hall, field researcher for anti-genocide group The Enough Project, told IRIN. "There must be accountability for the most responsible perpetrators of the most serious crimes. Previous amnesty deals for leaders of rebel movements in eastern Congo - whether it be military reintegration, house arrest, or third country resettlement - have not only failed, but continued to perpetuate conflict in eastern Congo," he added. "History in the region clearly demonstrates that there can be no peace without justice." According to a recent blog post by Stearns, despite the resumption of talks, the parties effectively remained deadlocked, with M23 saying "they would only put down their weapons if the FDLR are neutralized and Congolese refugees are allowed to return to the Congo, two goals that will take years to fully achieve". "On the other side of the table, the Congolese government has issued arrest warrants for Colonel Makenga, Kayna and Kazarama - the number one and two of the M23, as well as their spokesperson, respectively," he added. "It is difficult to see the Kinshasa delegation, or international observers for that matter, accepting an amnesty for these top officials, which would mean that the M23 would have to accept excluding its top leadership." Uganda's Kiyonga urged all parties - including the recently deployed UN Force Intervention Brigade (FIB) - to desist from further violence while the talks were underway. The latest violence broke out in July; by early September, however, the rebels had retreated from Goma following an offensive by the UN FIB. "It's unfortunate that we keep getting renewed fighting in the field. You can't keep talking yet there is fighting... Any shelling or shooting should stop," he said. "The UN is expected to respect the dialogue. I hope they will understand, [and] there will be no fighting as we talk." Humanitarian organizations working in the region are keenly awaiting the results of the talks but are unsure whether they will make a difference on the ground. "The key issue is that the M23 and the situation in Rutshuru area is not the only problem in eastern DRC. There are many other armed groups that are causing unrest, and many say that there is an increase in banditism," said Chantal Daniels, Central Africa policy and advocacy officer for the NGO Christian Aid. "In general, I'm afraid that Kampala will not change things significantly on the ground. Even if an agreement is reached between the DRC and the M23, it is questionable if and how this is implemented, what the conditions from both sides are, and what that will do with the further dynamics with regard to armed groups on the ground." She added: "Last week SRSG [Special Representative of the UN Secretary General] of MONUSCO [the UN Stabilization Mission in DRC] Martin Kobler mentioned that 'islands of peace' will be created. I am very curious to see [what] this will look like, also with regard to humanitarian access during operations, and to what extent these 'islands' can be sustainable." There has been some criticism of the ICGLR's handling of the talks and doubt about its ability to deliver a peaceful conclusion to the conflict. "The ICGLR has proven useful in its role as a convener. However, a fundamental flaw of the Kampala talks to this point has been lack of transparency, accountability and inclusivity," said Hall. "In order to make gains towards peace, stability and development in eastern Congo, a broader, more inclusive process is necessary that focuses on regional drivers of instability and brings to the table key actors that have been absent from the current talks - particularly the government of Rwanda." Also in question is Uganda's neutrality, particularly following the DRC government's August expulsion of Uganda's Brigadier Geoffrey Muheesi, coordinator of the regional Expanded Joint Verification Mechanism (EJVM), set up by the ICGLR to address DRC-Rwanda border security issues. It is thought Muheesi was expelled for being too friendly to the rebels and to Rwanda. "The talks are under the auspices of Uganda, which is not seen as neutral by Kinshasa, as demonstrated by the fact that the Ugandan general running the joint verification mechanism was recently expelled by the DRC. There is a clear lack of trust with the Ugandan facilitation," said ICG's Vircoulon. Despite the challenges, analysts say there is reason to hope that the talks, if handled correctly, could reach a positive conclusion. "Given the pressure and timelines put on both sides by the ICGLR, UN Special Envoy and other international partners, this iteration of talks presents the greatest chance thus far for agreement to be reached," said Hall, who noted that the success of the current round of talks would largely depend on both parties demonstrating "empathy and pragmatism". He continued: "For example, M23 cannot expect blanket amnesty and the full eradication of the FDLR in a two-week period, nor can the government of Congo expect temporary military gains made with support from the FIB and UN to be long-term solutions to dealing with the grievances of the M23."